In the spirit of Thanksgiving, 110 people came together to participate in Richland’s annual Turkey Trot on Nov. 20. This is the 45th year the run/walk has taken place. The Turkey Trot was sponsored by the Richland College intramural sports department and lasted about an hour. 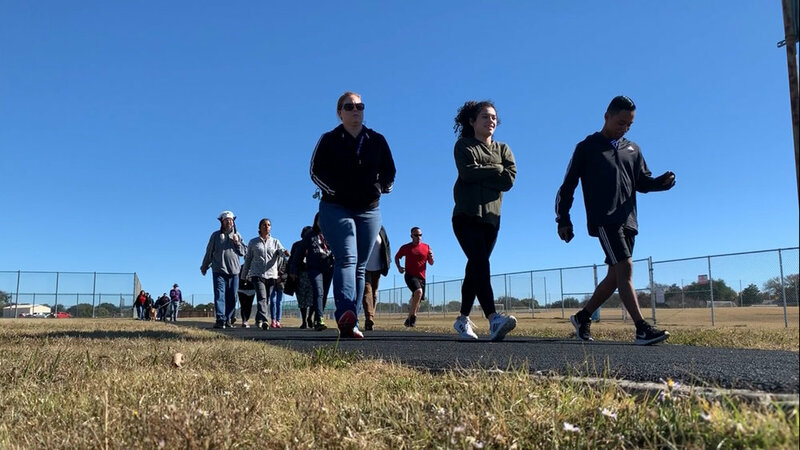 Richland students, faculty, staff and even some of their pets took part in the two-mile walk or three-mile run at their own pace. Every participant received a free T-shirt. The Turkey Trot was started by physical education instructor John Stanson in 1973. “I’ve done every one,” he said. Stanson started the event to bring everyone out to have some fun. It brought Thunderducks together like a family. “We did it just a couple of days before Thanksgiving. 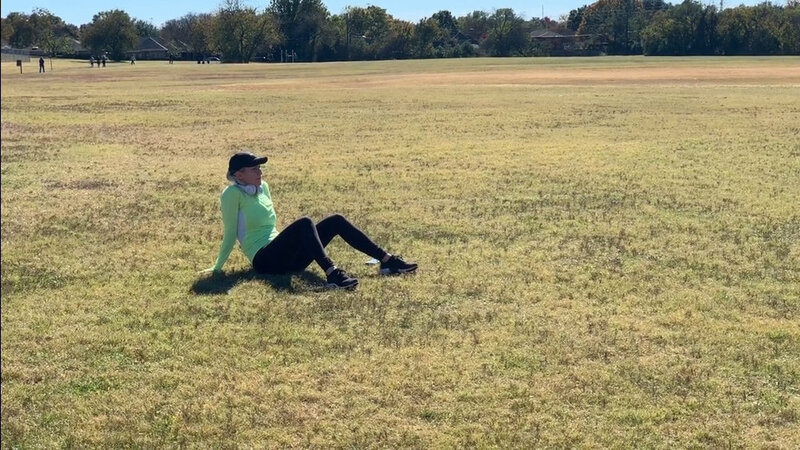 We just wanted to have some fun and let some people come out and enjoy exercising together and having the opportunity to burn some calories so they can eat more pumpkin pie,” Stanson added. According to Stanson, they’ve had 45 years of great weather for the Turkey Trot. “We’ve had a couple of cold and some rainy days. During the Turkey Trot, the rain would stop and it was just cold, so it wasn’t bad,” he said. The trot started off with students and staff stretching before the event, which started at 12:30 p.m. on a clear and sunny day. There was music, chatter among the students and staff and plenty of positive energy. 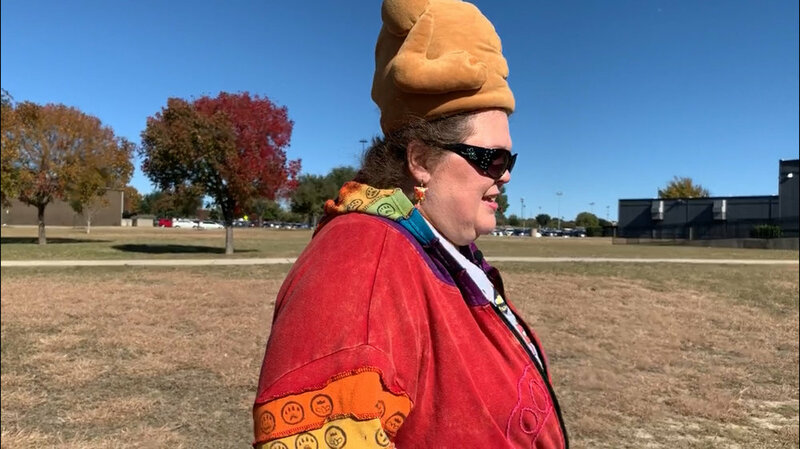 Janice Fallin, a Richland administrative assistant, wore colorful attire including a dancing turkey hat. “It’s a chance to get out in the fresh air, and it seems like it’s usually sunny and crisp air,” she said. Fallin hopes to bring her office friends in costume next year. The course started outside Guadalupe Hall by the small jungle gym. It wound around the tennis courts and toward the lake and around some of Richland’s lush fall landscape. The course continued between Medina and Guadalupe Halls and passed between Guadalupe and Uvalde Halls. Emeritus student and grandmother of three, Gloria Digby, said it gave her the chance to catch up. “I was in shape. This time, having been off for a couple of weeks, I’m not as much in shape,” she said. The first person to cross the finish line was student Olivia Bartosh. She has been at Richland for one year and is studying business management. This was her first Turkey Trot. “I try not to focus too much on the running itself, obviously. Once you get like that steady breathing in, it’s game on from there,” Bartosh said. She runs about 13 miles a week and loves to listen to hip-hop, electronic dance music and occasionally classic rock while running. After the trot, prizes were given to students and faculty. A number of different pieces of clothing were given as awards. They included long and short-sleeved T-shirts.